In today's New York Times Cara Buckley presents an entertaining piece by our favorite cartoonist, the hilarious and perspicacious Roz Chast. In it Roz talks about boredom, procrastination -- and her three pet birds, one of whom is a yellow and green parakeet named Petey. This reminded me of my Grandpop, who lived until just shy of his 103rd birthday, and his beloved parakeets -- one of whom was also yellow and green and called Petey. Click here for Roz's amusing article. 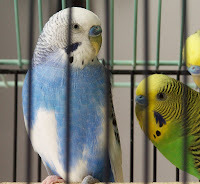 And, on a more serious note, enjoy the poem, The Parakeets, by the celebrated Mexican poet, Alberto Blanco. and at night bad dreams. with speech . . .